QUESTION: I went to my doctor for regular check up and was told two weeks ago that I am diabetic. Glucose was in my urine and blood sugar was 310. I purchase a blood sugar machine to monitor my blood sugar. for the past three days in the morning it is about 135 and 175 before breakfast. After breakfast it is 248-284. i have for breakfast 2 slices of wholewheat bread and steam vegetables. At night it drop to 94 or 124 and i fell sick at this level my mouth and tongue starts to tingle i feel extremely hungry.why do i feel sick at level 94. when i am off the meds i feel great but when test my bsl it is quite high at least 400.I dont understand when i am not on the meds and it is high i have no symptoms. I have been having a lot of vege lately and exercise but still feel sick. i have to go back to the first dosage because it is very high after breakfast. Having diabetes is not as simple as it seems and you have to work very hard in purpose to beat it. However, our aim is to help you go through this and now I will explain you what exactly is going on with and how to handle with the blood glucose elevation. First, you are feeling great when your blood glucose level is high, because you got used to such high blood glucose concentration of 300. However, this is not good for you, because it damages your entire body. When your blood glucose level is about 94, as you said, you experience hunger, because your body generally works with higher blood glucose concentration. So, the main purpose of ours is to bring your blood glucose down for about two weeks and then the sensation of hunger, during blood glucose value of 94 will be gone. According to my opinion, the first doctor gave you too much drugs and the second one, very few. As diabetes requires almost permanent therapy adjustments, this means that both of your healthcare providers are experienced and they were trying only to find out the exact daily dose suitable for you. So, you have to talk with one of them and to show him the results, which you have during the last treatment of yours. In this way, it would be a lot easier for him to establish the exact daily dose of the blood glucose lowering drugs. Second, very important thing is that the treatment of diabetes is related not only to the drugs, but even to the lifestyle changes. I want you to remember that the exercises and the diet are something very important for you. Regarding the exercises, you have to try running for at least 30 minutes every single day. This physical activity will burn the excessive amount of glucose in your body, which will lead to normal blood glucose result- between 64-8 and 104.4 mg/dl. Besides this, it would be best for you to elevate the time of running every month. For example the first month run for 30 minutes and the next one 40 minutes a day. With regards to the diet, you have to follow two simple rules. The first is to eat small portions 5 times a day and the second one is to forget about eating chocolate, candies and other sweet stuff. In addition, I have to inform you that eating pork or beef is not something good for you, because they contain too much cholesterol. This is quite important, because patients with diabetes have cholesterol problems too. Something else, important for you to meal plan is that you have to concentrate on eating vegetables, fruits and fish. Something regarding the tests for diabetes is that you have to measure your post-prandial blood glucose two hours after having a meal, not right after having a meal. The fasting blood glucose test has to be executed in the morning, before having a breakfast. There is another very suitable option of you. To stay on the treatment provided by the second physician and to combine diet, exercises and to take in consideration the usage of herbs. 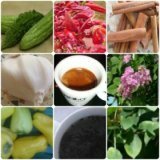 I want to inform you that the pharmaceutical industry offers a lot of herbs, like gymnema sylvestre, bitter melon and cinnamon, which are lowering your blood glucose level. Those herbs are only reinforcing the effect of the glucose lowering pills, which means that you are not able to use only them to control your diabetes.